ChevroletCruze.net – General Motors today announced a demonstration project to explore market needs and customer acceptance of battery electric vehicles in Korea. The project involves a fleet of electric vehicles based on the successful Chevrolet Cruze. The result of shared development with GM Daewoo, LG Chem and LG Electronics, the electric Cruzes will be part of a demo fleet that will operate in South Korea’s capital, Seoul. The project is aimed at benefiting GM’s core vehicle electrification competencies, which include batteries, electric motors, power controls and charging. It will provide real-world data on customer acceptance of battery electric vehicles, studying driving patterns and charging behavior while sharing costs and resources. This is a key initiative in GM’s global battery and electric vehicle development strategy. The demo project is expected to launch by the end of October. GM demonstration fleets with other partners are also being launched in other urban markets later this year. The Cruze EV demo fleet will be the first full-size sedan electric vehicles to hit the road and will be powered by batteries from LG Chem and propulsion systems (motor/inverter) from LG Electronics. 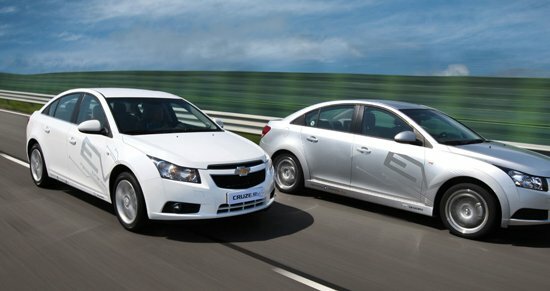 GM’s EV demo fleet in South Korea will consist of Chevrolet Cruzes and GM Daewoo Lacetti Premieres. GM currently markets the vehicle under the local brand in South Korea. The Cruze EV is equipped with a 31-kWh battery that generates maximum power of 150 kW. The demonstration fleet will be monitored closely to determine the amount of real-world range achievable by a vehicle of its size. On specific test schedules conducted by LG Chem, the demonstration vehicles may achieve a range of up to 160 km (100 miles). The vehicles can go from 0 to 100 km/h (60 miles per hour) in 8.2 seconds with a maximum speed of 165 km/h (102.5 miles per hour). On a standard household 220-volt outlet, the Cruze EV can be fully recharged in 8 to 10 hours. Part of the demonstration fleet’s task is to test a “quick charge” application that could reduce the charge time significantly. “Although there is much more work to be done, our ability to develop this vehicle in less than a year offers a peek at the very promising plans we have for our customers in Korea and around the world,” said Mike Arcamone, GM Daewoo President and CEO. While battery packs often occupy trunk space, the Cruze EV’s battery pack is mounted on the underbody. This gives the Cruze EV the same trunk space as conventional vehicles with gasoline engines. Since 2008, GM has been working with LG Chemical, which is the exclusive supplier of battery cells for the Chevrolet Volt electric vehicle with extended range. The Volt enters the U.S. market later this year. The development of the Chevrolet Cruze EV demo fleet will expand this collaboration.